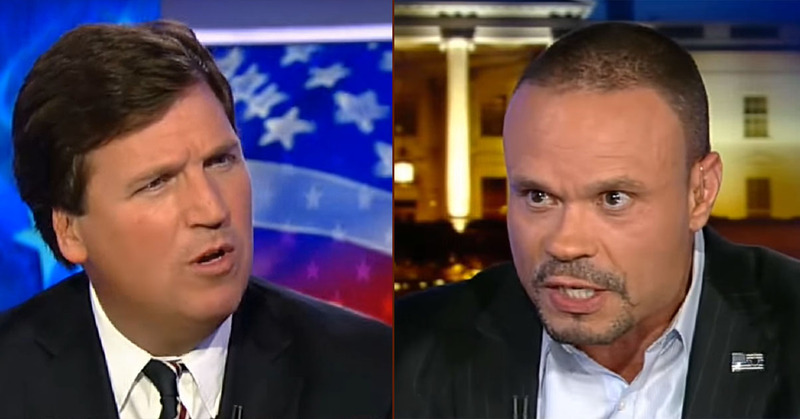 In opening his interview with Dan Bongino, Tucker Carlson presents his position that the real issue is the political use of our intel and law enforcement agencies, and that has apparently happened. Bongino points out the hypocrisy of the Democrats, supposedly the party of civil liberties, who have not only engaged in criminal behavior that has suppressed and attacked the civil rights of Americans but they have also gone suddenly silent on the offenses that their party has committed. He points out that the Democrats are “all scurrying like roaches when the lights come on. They know what happened here. To spy on someone in the United States is legal if you can produce probable cause, using legal means, of a crime or that someone is acting on behalf of a foreign agent” or as a foreign agent in violation of a United States statute. He notes that not a scintilla of evidence has been produced implicating any member of the Trump team in the supposed mission of getting to the bottom of Russia-Trump collusion. There never has been and still remains no justification for the anti-Trump investigation and witch hunt from a legal standpoint. It is entirely political and as he indicates, those politics go all the way to the top of the Obama regime. Carlson asks what the rationale could possibly for Democrats choosing not to read the Nunes memo, with only a dozen Democrats outside of the Intelligence Committee opting to read it. Bongino answers that question and explains his belief that Obama is implicated in the corruption scandal by the information contained in the memo. He points out that Sensitive Compartmented Information Facilities, SCIF, are not interconnected, and that information located in one that may not available in another, requiring actual travel to the particular facility in order to access it. He says, “It is not a coincidence that Devin Nunes, who has an entire scope of what happened, went back in March to the White House facility to read very specific intel that I think is very likely will be in this memo.” Those were the time in which some of the initial findings of spying on President Trump by the Obama regime were being uncovered. Once Obama is deported back to Kenya and all of his crooked friends are behind bars our President may have a chance to be a President. I’m surprised that he has managed to get as much done as he has. He is a fighter. The swamp creatures underestimated him “bigly” and also us “deplorables”. “…They believe that dangling red meat issues like the border wall in front of Trump supporters, or occasionally rattling sabers against North Korea or Iran, giving those in the base just a taste of what they want, is enough to keep them placated while the establishment pursues its own ambitions. Trump supporters are still in the honeymoon phase right now, so that strategy may work, at least for the present. Why does the word “SEDITION” keep popping up in my mind? of course the MUSLIM FRAUD knew what was happening, HE ORDERED IT. stuff like this just does NOT happen without the head man knowing about it. and all those scumbags will all pay the piper before it’s said and DONE.